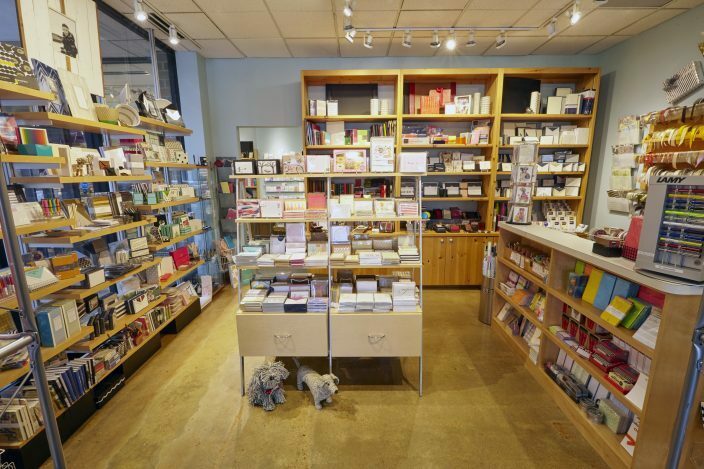 Today we’re shining the spotlight on The Stationery Station, a paper + gift shop based in Highland Park, Illinois celebrating 40 years in business! We sat down with the owner, Sheryl Oberman, to learn about the shop and how everything got started. I have loved paper and party planning since I was a child, watching my mom, who had some flair, create accessories for events she would host. She also planned a beautiful wedding for me! My college degree is in teaching high school English, with a minor in Rhetoric – so you can see where this is going. I took that background and love for paper several steps beyond. Totally by coincidence a friend, who also loved paper, went to a local shop to buy party goods for me since I had just recently moved to this town and had a newborn baby and was having a party. I knew little about our neighborhood and could not yet get out to explore. She came back and told me the lady was selling her business. Without blinking an eye I said, “let’s buy it!”. 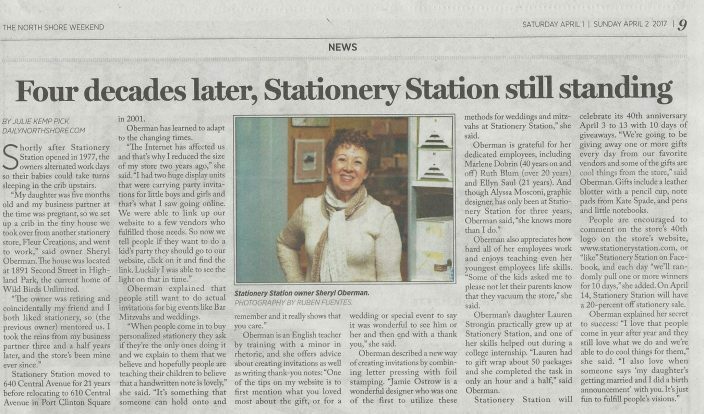 The shop was in a converted old home and I suggested the name Stationery Station and my partner agreed, with the stipulation that we use a station master as our logo. We had a lamp post out front so we hung our sign and suddenly became stationers!! Our husbands were agreeable and the former shop owner mentored us for a few months. My partner was pregnant at the time and once her child was born we alternated days and our babies napped in a crib we added upstairs. When the babies were a bit older they sometimes crawled around the carpeted floors as we worked with customers! My daughter once chewed on a package of napkins. Later on, the kids were with day care, our families, or preschool. After about 3 years we split up and I moved the shop to the main street a block away. About 20 years ago I opened a second store in Chicago with someone who had worked for me as a teenager. I licensed my name to her and she had the shop for several years until she started a family and moved back to our town. 16 years ago I moved the shop a few doors away to our current location. 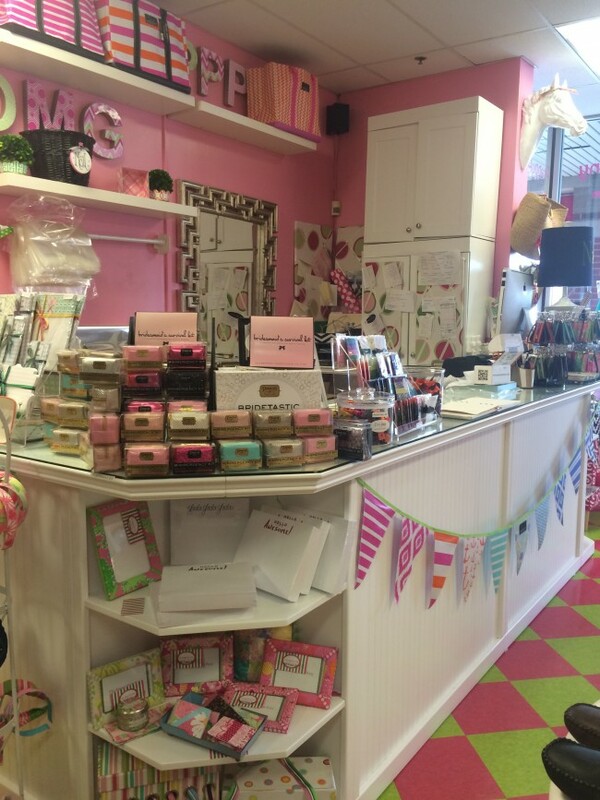 It was 2 shops so that our retail merchandise could be in one room and our custom invitations in a smaller room. This allowed us to offer a quieter area to give total attention to our customers with a more personal touch. Two years ago I recognized that children’s invitations were not selling well and had become more of an online item. They were displayed on 2 units so that was my cue to downsize! We linked up on our website with a few large vendors that sell the kids’ items and that is working out nicely. 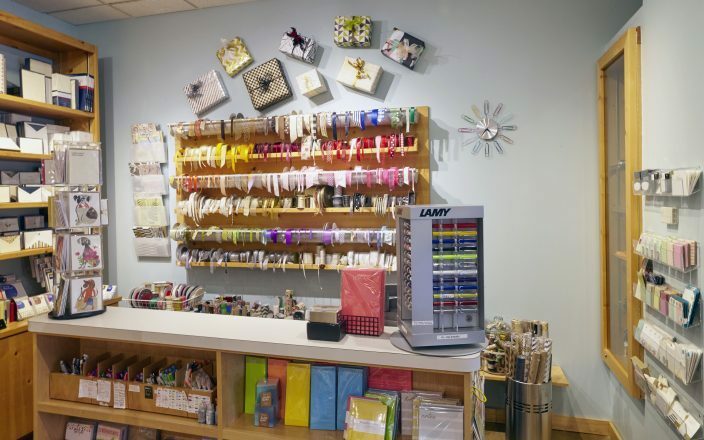 The “old” store still offers cool desk accessories, leather items, notepads, and my favorite – ribbon and wrap! 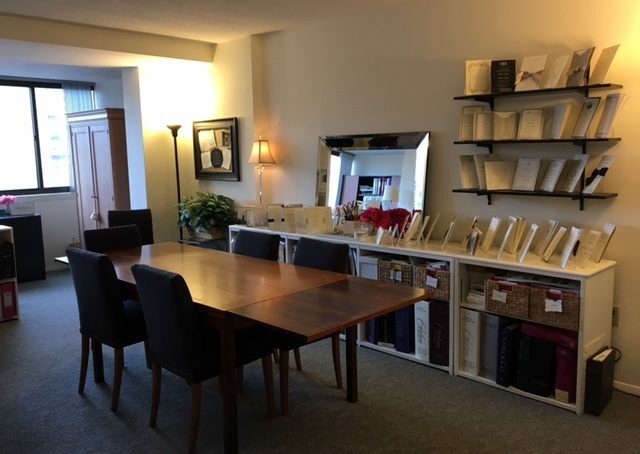 The custom room has imprintables along with a few other related items but primarily has many, many invitation albums, as well as loose samples from Smock, Bella Figura and other vendors. Brides, in particular, like to view loose samples, and we also show these on a screen and in boxes so that their customization options are evident. I enjoy creating invitations and bringing a customer’s vision to reality. It’s rewarding to me to know that someone puts our store on their list of places to go on any day. 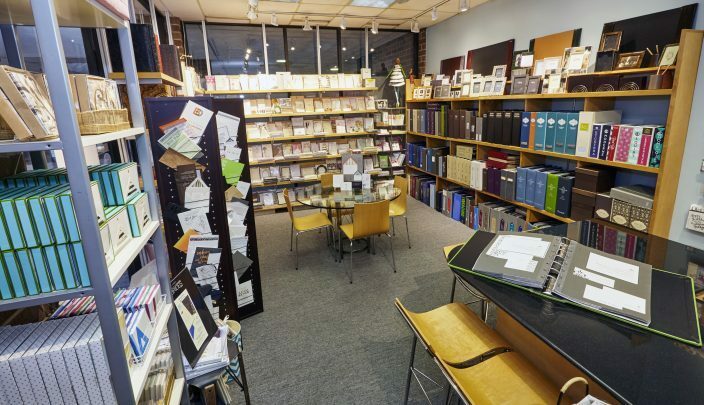 My education and knowledge of proper etiquette and grammar, combined with our design sensibility, plays a part in our status of being one of the finest stationers on our North Shore. I believe that being able to open a shop 40 years ago and calling it our own was and is special. The freedom to be able to pursue a course that was never clearly my dream but became my love is genuinely amazing to me. Women at this time were teachers, as I was initially, doctors, attorneys, and so on… yet owning a shop seemed rare and slightly difficult to explain to the bank. One last love about the store is to be still creating an invitation or even wrapping a gift for our customers and seeing them genuinely thrilled! A recent customer just wrote me a wonderful note, and these testimonials and calls make us feel respected and rewarded. It is a heartwarming business and our goal is to fulfill a customer’s vision and offer them our valued advice. Does your store support any charities or special causes? We offer a donation or place an ad nearly every week with several charities, schools, and local or needy organizations. At the time of our 35th anniversary, we donated a portion of our sales to a group that supports women getting into the workforce. This year I am considering other options. One of the retail lines I carry is called Monkey Business and we sell their beaded animals and a few bowls made from phone wires. They are in South Africa and the company benefits the women who make these. Many of our customers who have traveled to Africa recognize these and buy them or comment on how wonderful it is that they are so well made and the women reap the benefits. If someone is visiting your shop, what are the other essential stops in your neighborhood? Our town has wonderful cultural features. One is actually across one of our town’s main streets in the next town but it is literally 5-10 minutes away. This is the Chicago Botanic Gardens. They feature exhibits throughout the year, events take place there and it is truly a beautiful, cultivated sight. I run there in the warm weather on one of their tree lined paths! Another is the wonderful Ravinia Festival. It is an outdoor performance venue featuring major symphonies, renown musicians and performers. There are children’s features throughout the year as well. Tickets may be purchased for a covered pavilion or many, many people from all over the Chicago area come to have casual or elaborate picnics on the lawn. Restaurants are plentiful in all price ranges and it is an amazing feature in our town. Since Highland Park is located on Lake Michigan we are very excited to have stunning beaches. One was redone recently with walking trails, bluffs, rock formations and a lovely glass building in which they offer children’s classes. 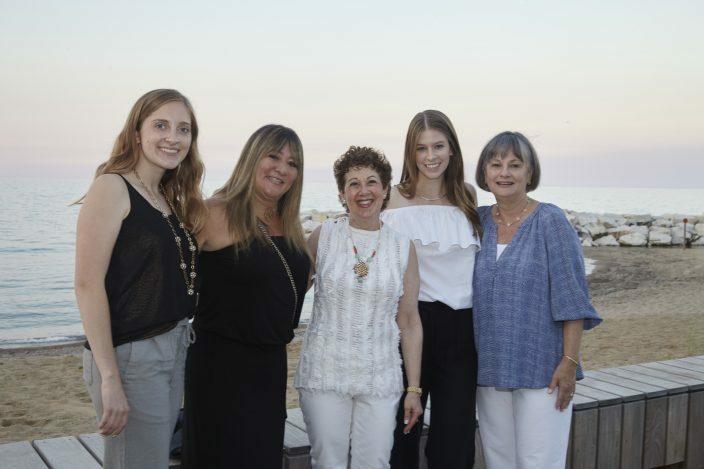 Last June I made myself a birthday party on the boardwalk (luckily on a beautiful evening) and was joined by my amazing staff (see below). In my shop, I love my ribbons and wrap. I do custom gift wrapping and was chosen and flown to NYC along with 7 other people a few years ago to be in Scotch brand gift wrap contest. It was very exciting and although I did not win, being chosen as one of 8 was very cool! Our current favorite trend is really a trend I was naively offering my customers and yet had little knowledge of 35 or more years ago! I love combining letterpress with foil stamping. It adds just the right amount of flair when done subtly. 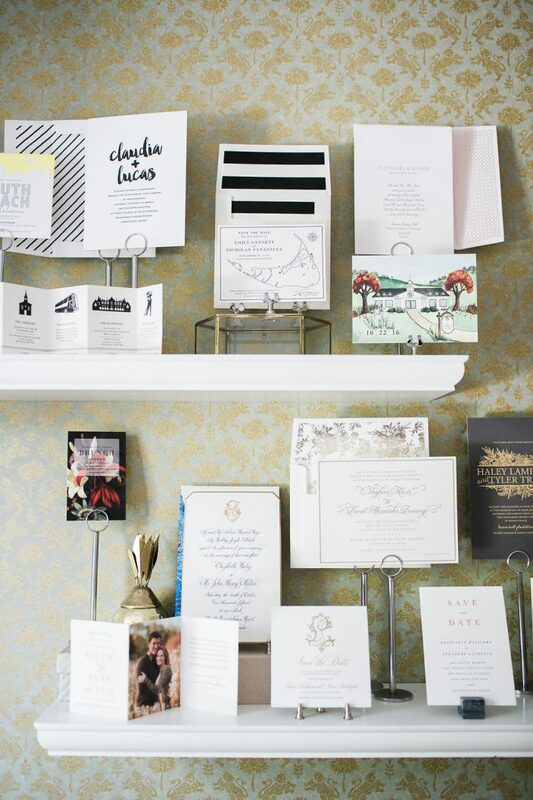 In our early years we worked with a man who owned a foil stamping company, and since he lived in Chicago we became friendly with him and he would print our stock for note cards or invitations. At that time, we carried Crane and a vendor called Fante. Once in a while, we would need to go to his home to pick up an order and he would show us his machinery which in those days used individual pieces of lead. He showed us how he pressed these pieces of lead into the machine! Aha! Letterpressing! He would remind us to limit the copy on an invite so he would not run out of letters! 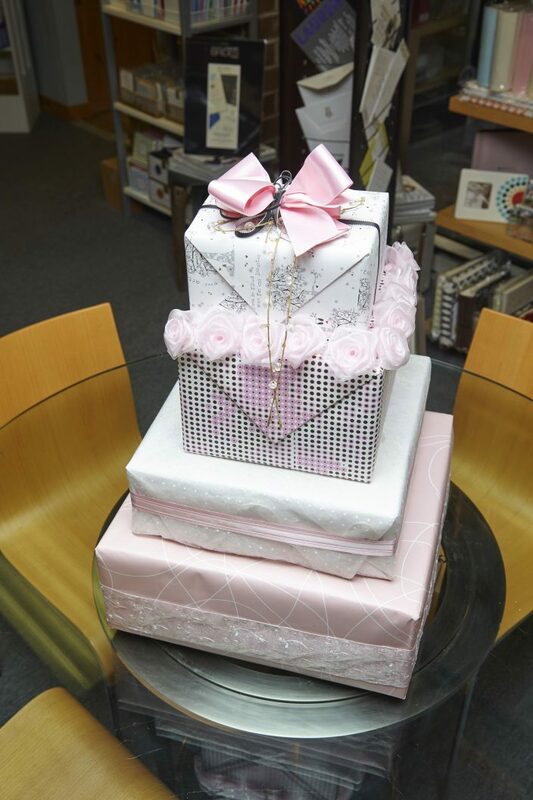 Many thanks to Sheryl for giving us a glimpse inside her shop – and congratulations on 40 years in business! Here’s to many more! 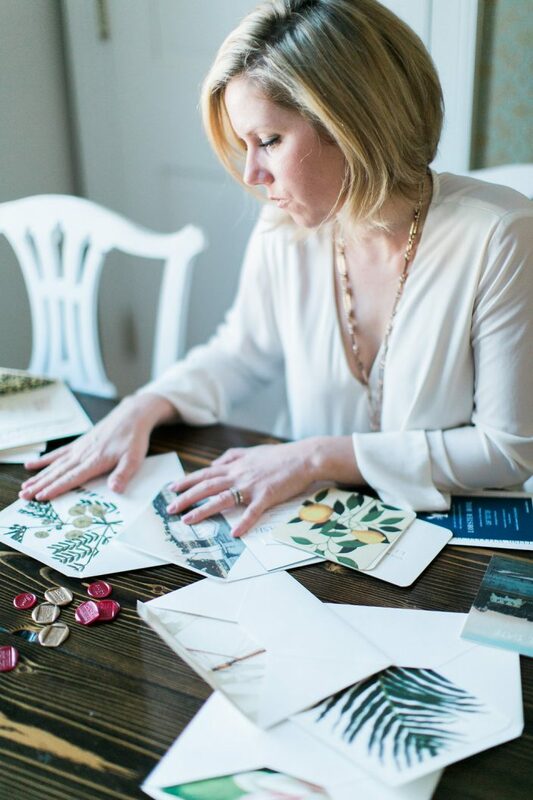 Today we’re sharing a peek inside the studio of Boston-based Invitations & Company. 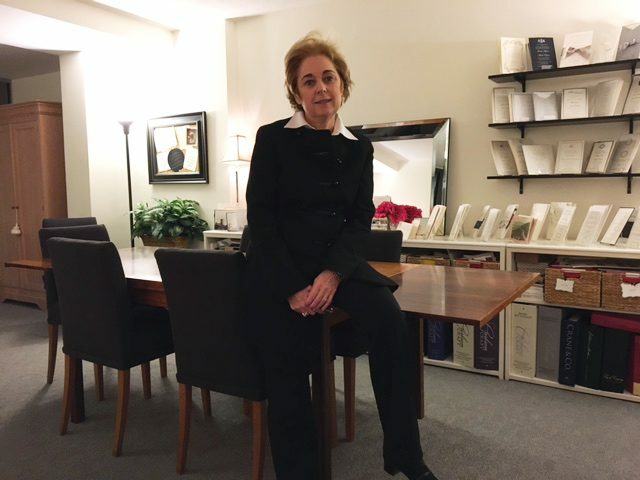 Founder Arlene Cronk is celebrating 25 years in business this year, and has crafted a warm, intimate space for her clients. 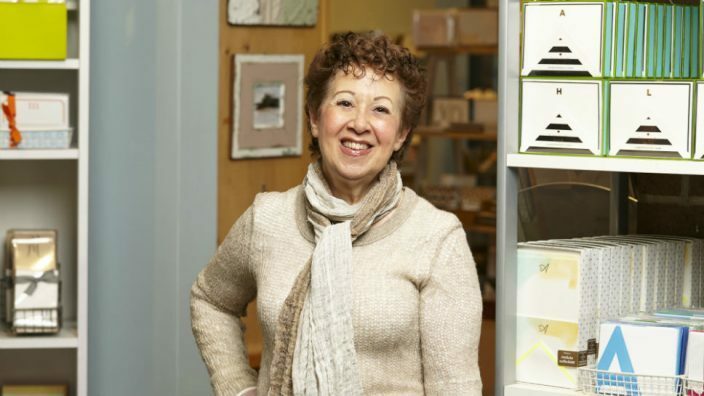 In addition to running a successful stationery business, Arlene founded the Boston Wedding Group and Marketing to the High-End Bride. BWG is the largest and oldest wedding industry association in New England, while Marketing to the High-End Bride is the most widely attended event for wedding professionals in New England. Arlene also founded a New York Wedding Group, where she was president from 2004-2006. We’ll let Arlene take it from here! I started the business right after returning from a Caribbean cruise in December 1991. At breakfast and dinner we had been seated with another couple and the wife, Amy, ran an invitations business from her home in the Cleveland area. She and I would take walks along the deck most mornings and during those walks she would describe her business, and I knew immediately this was something I wanted to do. 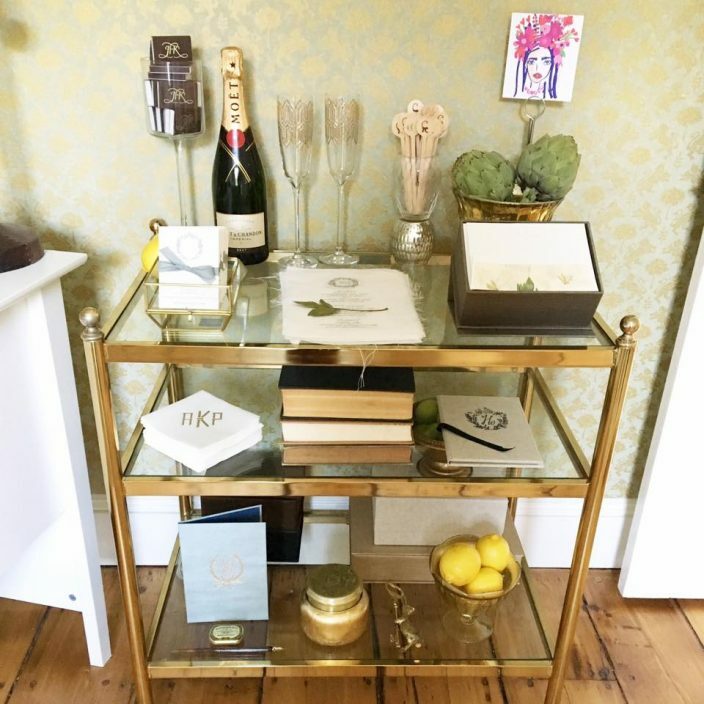 So, the next day after coming home I set up an office at the end of our living room in our Boston apartment and that’s how Invitations & Company began. The space is different from most invitation businesses. It’s not a store and it is no longer based in a home. 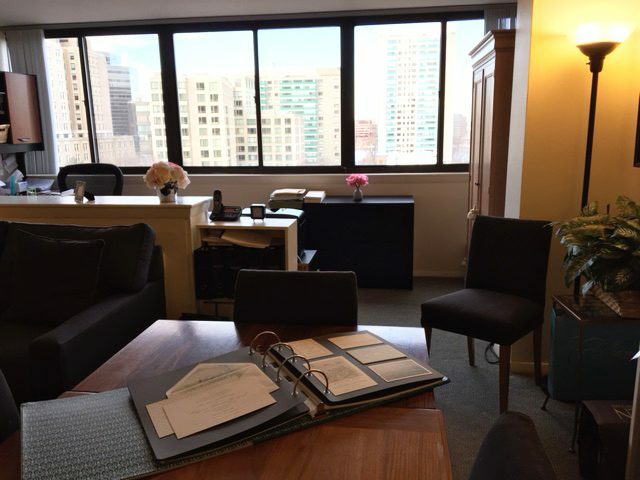 It is a separate studio unit in a downtown building that looks a lot like someone’s living room, with a small office at one end. We have comfortable couches and chairs and also a large table where we meet with customers and spread out albums of invitations. Along the walls we have shelves and shelves of albums and invitations on display. So the space is very homey but also very professional. It is very convenient for customers who live or work downtown. We also draw a lot of customers from nearby suburbs who are looking for a huge selection, lots of personal service, and a very personalized shopping experience overall. What I love most about my job is that it feels so right for me – I like to say that ‘I’m completely self-actualized’ doing this. I was an art history major in college and later earned a masters in social work — and this business combines the art and creative aspects with the social part. Most of my customers are engaged couples and planning a wedding can be very stressful, so the fact that I used to be a licensed social worker helps a lot. In fact, for six years I ran a program called the Bridal Survival Club. The most challenging part of my job is that I have to be “on” all the time. I am always dealing with invitation issues and talking with customers and invitation vendors, even when on vacations. There is a lot of pressure because my customers expect impeccable products and services, and rightfully so. 5 favorite things in your shop? My bulletin boards with photos of brides, and brides with their mothers and grooms, when they see their invitations for the first time. My photo of Randy Fenoli (“Say Yes to the Dress”) and me. My office carpet (I scoured every store in Boston and New York until I finally found something I love!). My large worktable with lots and lots of space to spread things out. I am really proud of the many great online customer reviews I’ve received over the years. If someone is visiting your shop, what are the other essential stops in your neighborhood? Anything on Charles Street in Beacon Hill — boutique apparel shops, gift and gourmet food shops, cosmetic boutiques, restaurants — they’re all great! Does your store support any charities or special causes? Friends of the Public Garden, The Yellowstone Association, and Angell Memorial Hospital (a veterinary hospital). Current favorite design trend?I love vintage floral patterns and metallics. 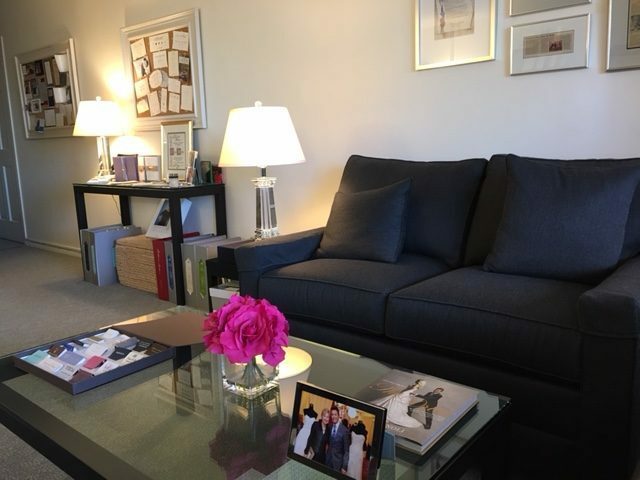 Many thanks to Arlene for giving us a peek inside her cozy space! 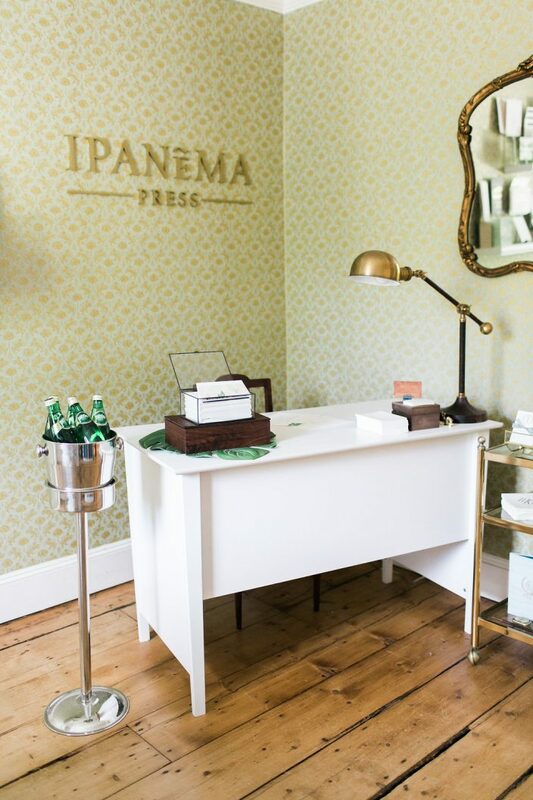 Today we’re shining the spotlight on Ipanema Press, a charming stationery boutique in the historic town of Cold Spring Harbor, New York. 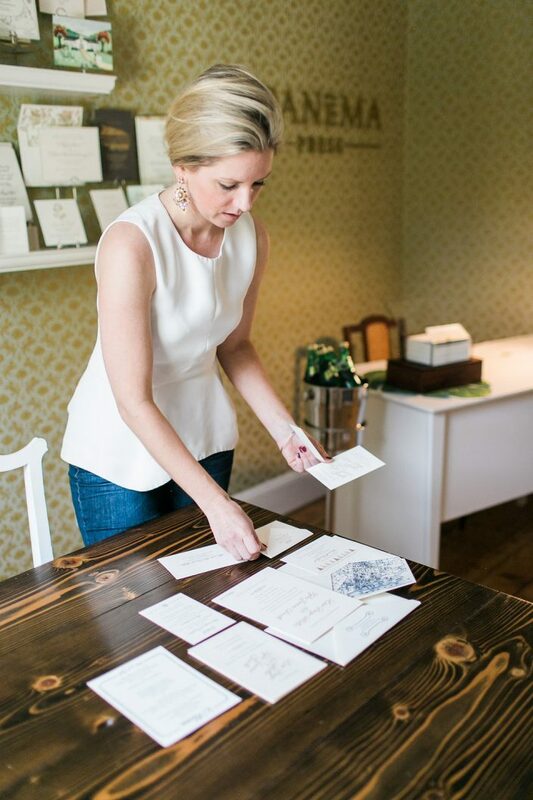 Ipanema Press specializes in custom wedding invitations and social stationery, and today we’re giving a peek inside their charming studio. 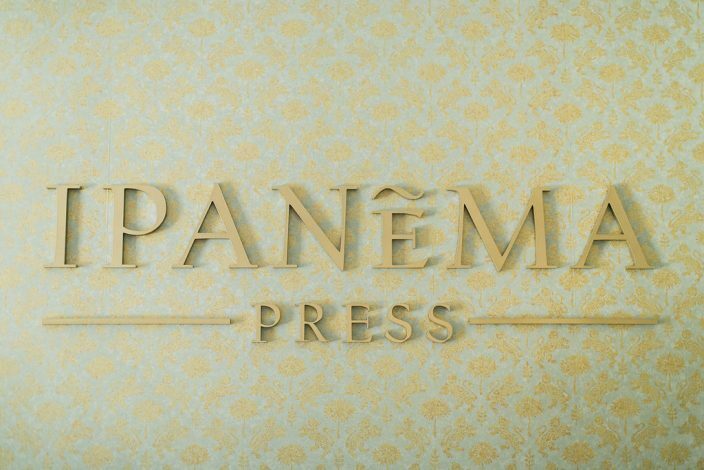 We’ll let Adrienne, the owner of Ipanema Press, take it from here! The name comes from that famous bossa nova song. The word “bossa” is an old-fashioned slang for something that is done with particular charm, natural flair or innate ability. This is the essence of who we are so the name was a perfect fit. I was a fine stationer in New York City for 6 years before starting my own company. I chose the historic town of Cold Spring Harbor to launch Ipanema Press in 2013 (the same year my first son was born). 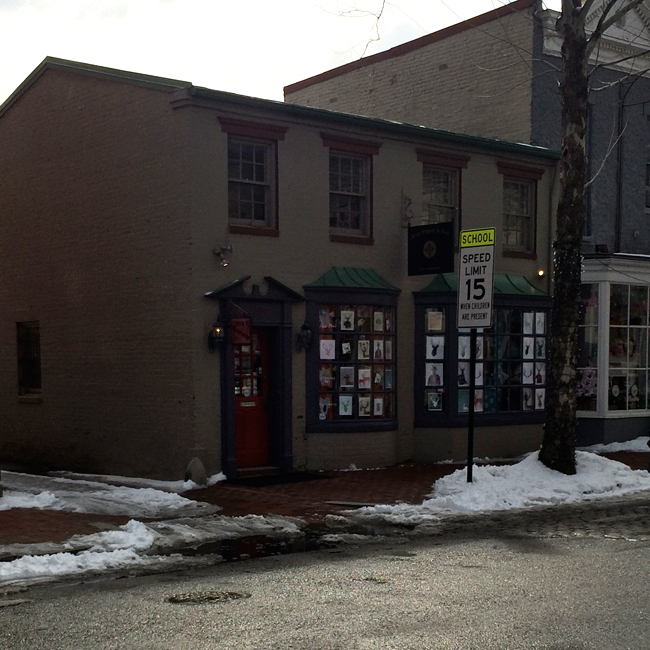 Our building dates back to the late 1800’s and was originally the home of a whaling captain. The original wood floors are still here – and are my favorite feature in the studio. I genuinely love helping new couples create custom art for their wedding. 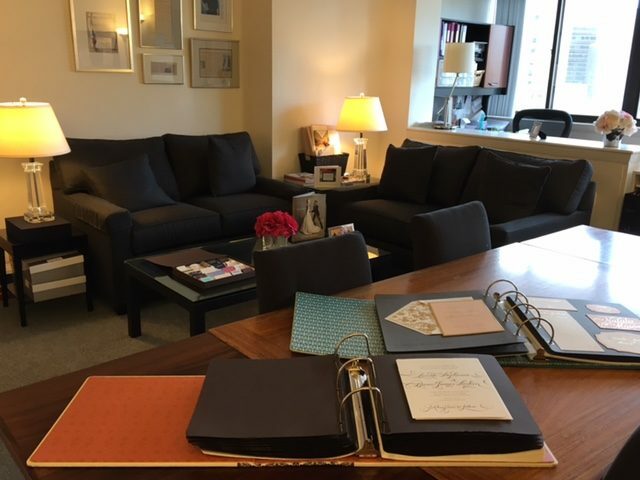 Our clients often tell us that their experience with us was one of their favorites in the planning process and that brings me great joy. We collaborate with the country’s most talented artists, calligraphers, and printers. We truly love what we do! A challenge is that we can only take 3 appointments per day in order for us to give each project and client the attention it deserves. This gets especially hard during the busy months of spring. Current favorite design trend? 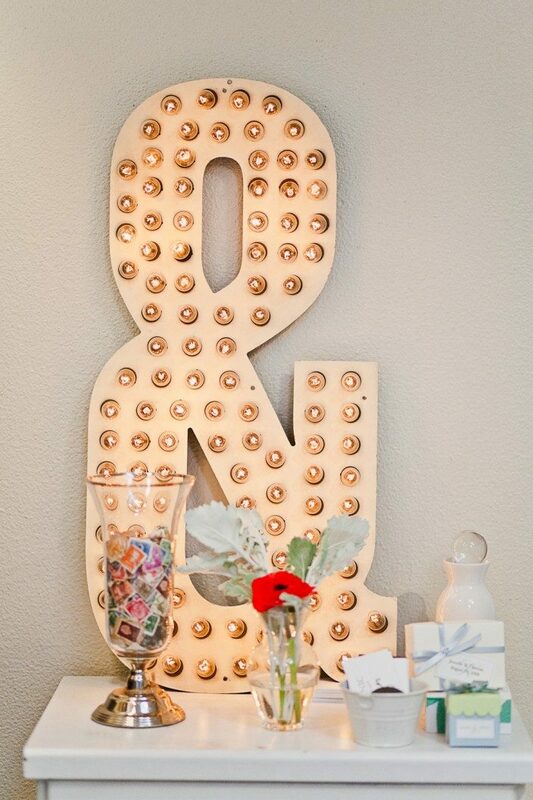 The mixing of print methods – particularly foil + letterpress + watercolor accents. It adds great textural interest and it just so unusual. Hoping to play with more print combinations in 2017. If someone is visiting your shop, what are the other essential stops in your neighborhood? 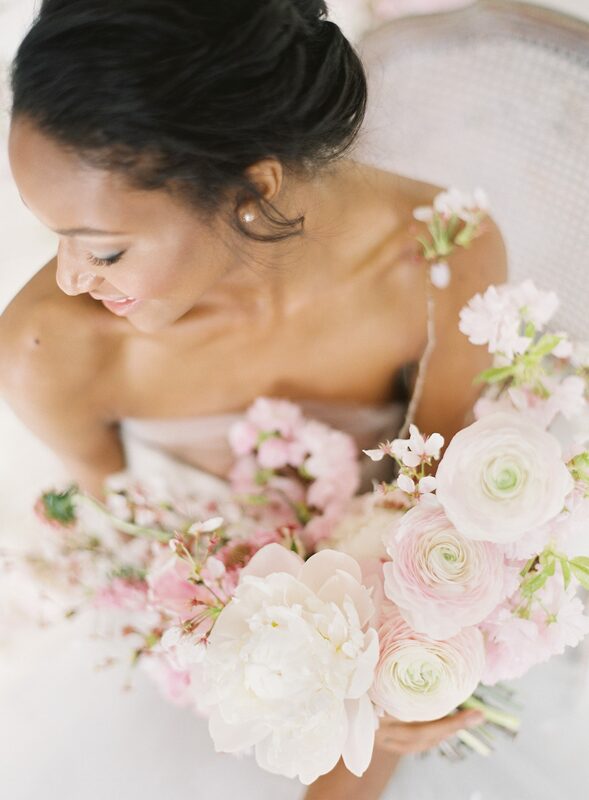 AvaFlora – Lori creates the most gorgeous garden-esque floral arrangements and specializes in weddings. 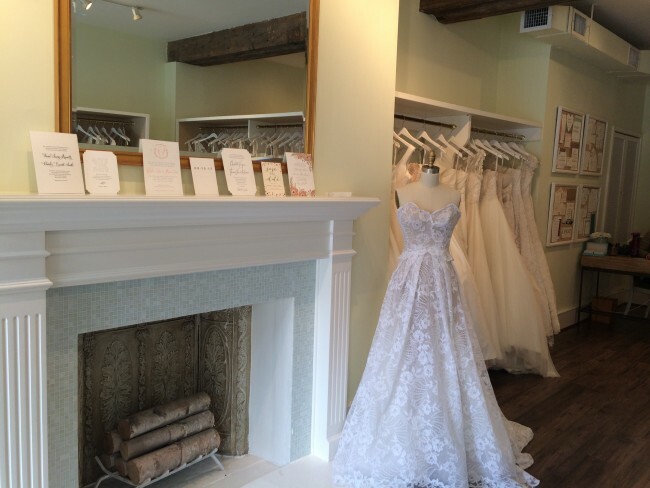 Harbor Bridal – Leigh and Tori have a beautiful boutique of wedding gowns right in the heart of town. Sandbar – the perfect spot for lunch on the harbor. Sweetie Pies – they have the best ice coffee (the ice cubes are even made out of coffee, we are addicted!). 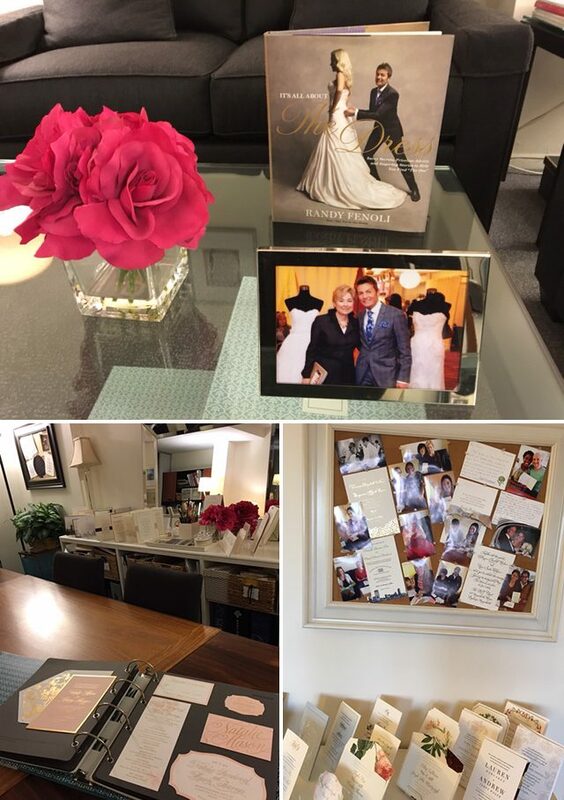 Many thanks to Adrienne for giving us this peek inside her studio! 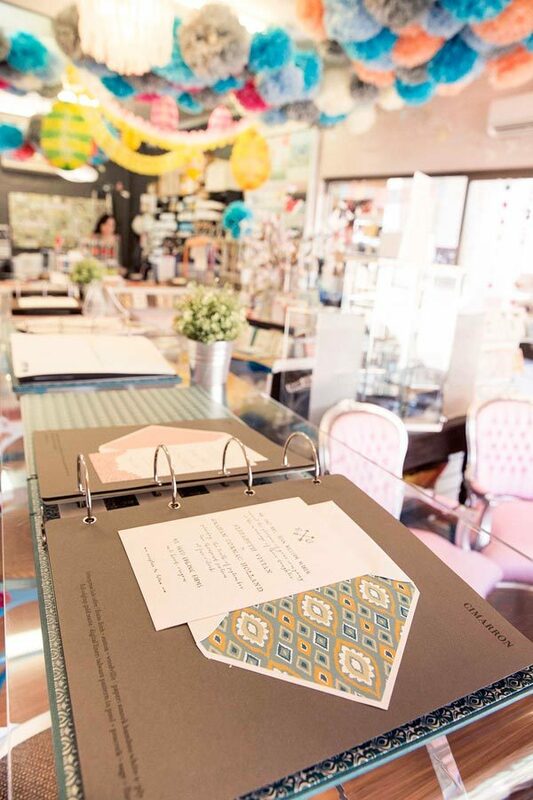 Be sure to follow Ipanema Press on Instagram for even more inspiration from this sweet stationery boutique. All photos by Cadence Kennedy. 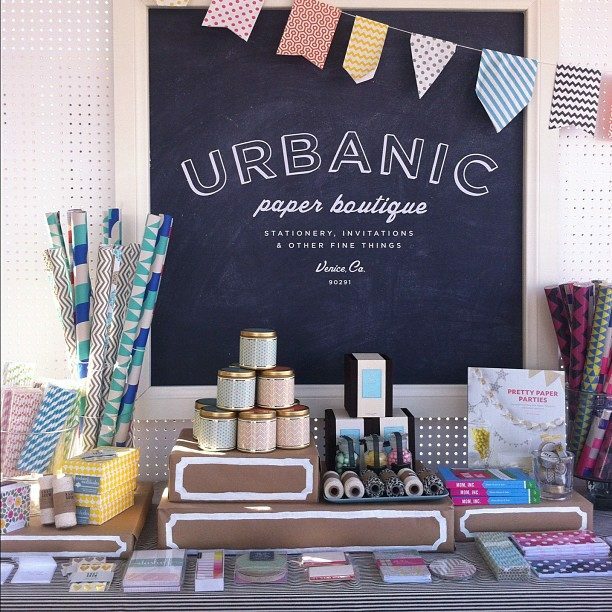 Shopping the show: tips from Urbanic for a successful trip to the National Stationery Show! 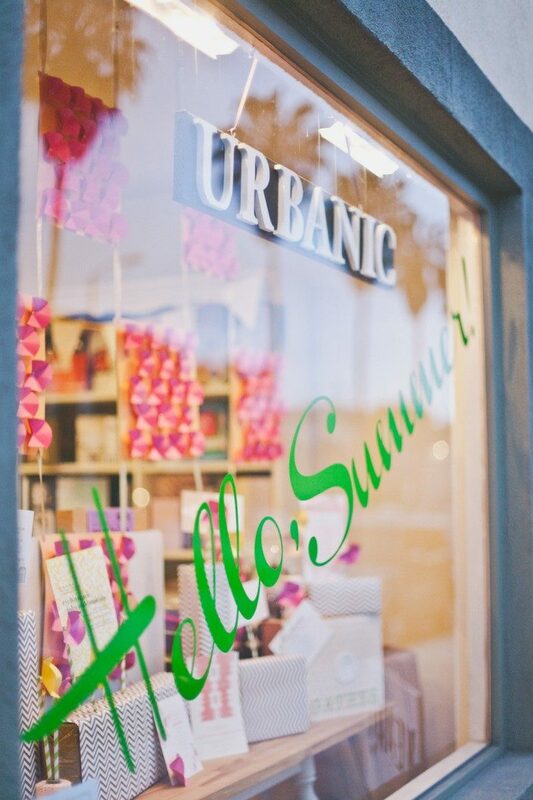 Whether you’re a first-time attendee or a seasoned Stationery Show vet, we know you’ll appreciate these 10 helpful tips from Audrey Woollen, owner of Urbanic Paper Boutique in Venice, California. 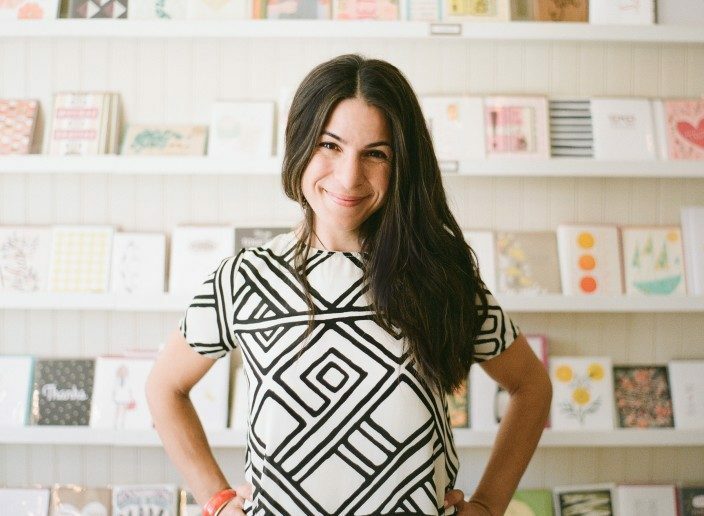 Audrey travels cross-country for the show, and her shop always features an amazing mix of carefully curated paper goods. MAP OUT A PLAN: The NSS walking map is a great tool to use prior to the show. When I start receiving booth invitations, I add the booth numbers of the lines I am interested in visiting and keep tabs on the booths per aisle as destinations. I’ve learned from experience that it’s easy to accidentally miss a booth (especially the smaller ones) if I’m not intentional about finding them. I save the lines that are more comprehensive for me to write until my last day — since they take a lot of time, I try to really hone in and focus without distractions. PLANNING TIPS FOR FIRST-TIME SHOW ATTENDEES: When you arrive, walk the show first to take it all in — and keep track of the booths you want to make sure to visit. After you’ve done a walk-through, it’s always a good idea to start in the middle of the show and work your way to both ends. This will prevent you from getting caught up in the traffic cluster of the end aisles during those peak show hours and will help kick off your show pace at a more even level that you may need as a first timer. GET ORGANIZED: I always come to the show with a notebook divided up by the months that I’m ordering for. That way I can mix up the product assortment, and keep track of what is coming in and when. This also helps budget out each month for our cost of goods and evens out the flow of entering and receiving. As for show buying, I write all of my orders as I go from booth to booth and comb through all of them by month a few days after the show. This is where the real work comes in: moving around delivery dates, referencing catalogs, and editing where needed. Since I travel across the country for the show, I try not to take too many catalogs home from the booths. I request that they be sent out to me and only take the ones I feel that I’ll need to reference right away or lines that I’m considering writing but have not committed to yet. THINK AHEAD: I’m always on the lookout for product themes that go well together for promotional content. I’m always thinking ahead for store newsletters, features and merchandising concepts while I’m doing my buying. FIND INSPIRATION: I let the booth displays, product trends and the pulse of the amazing NYC shops and restaurants fill my creative cup to overflowing with new inspiration for Urbanic. I take it all in and let this consolidated creative energy inspire and recharge me for store windows, line collaborations, special events and everything in between. My phone back up charger is my #1 necessity at the show (…besides food and water, of course!). I take photos of everything, which helps me document the inspiration and the goods we have coming in. It also makes for great social media content during the show and after. STOP FOR A SNACK: There is a little deli called Frame just up the street from the Javits on 33rd Street. This is an amazing little place to stock up on good healthy snacks for the day or even a great place to hop out if you want to get some fresh air and an amazing salad. Keep in mind it’s not open on Sundays though — I forget every time! Whether you’re heading to show or following the action on Instagram, be sure to follow along with Audrey’s 68.4k followers on Instagram and see her snaps @urbanic! 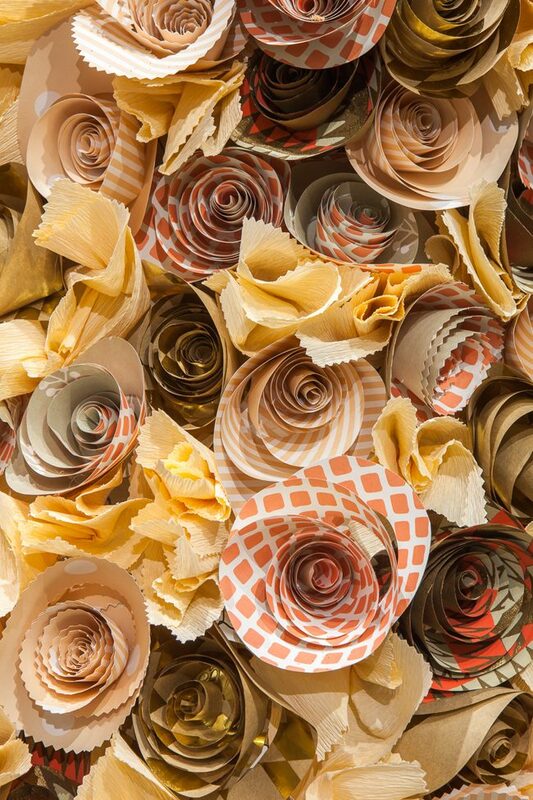 You can also see updates and new product sneak peeks on our account @smockpaper! We’re heading to New Jersey! 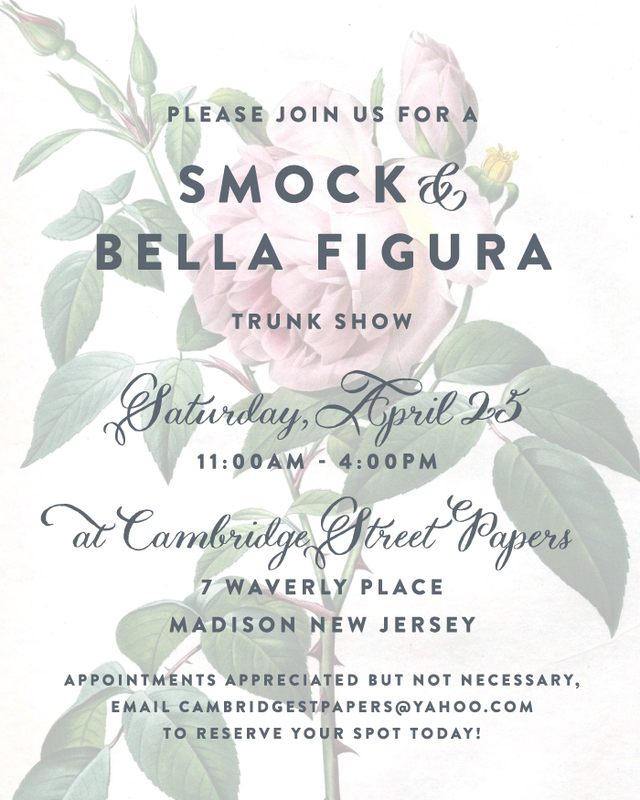 Join us this Saturday, April 25 from 11am – 4pm for a trunk show event at Cambridge Street Papers. 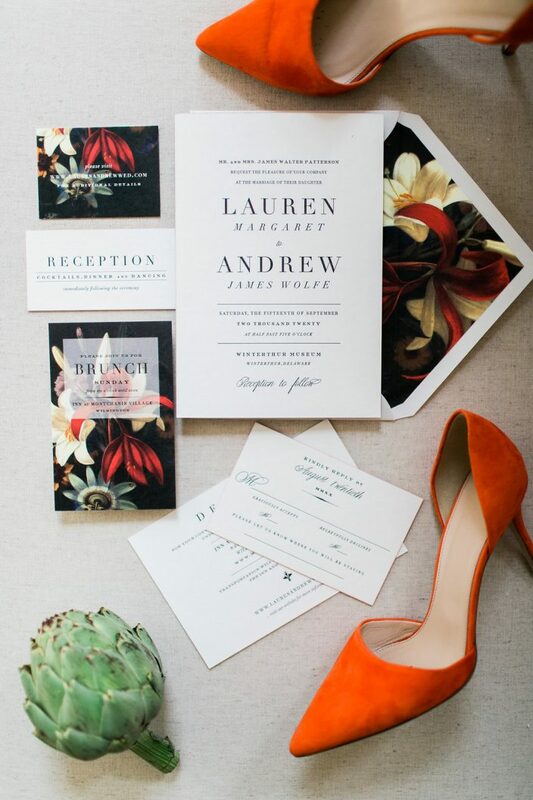 We’re offering 25 free invitations with the purchase of 75 invitations or more to trunk show attendees. Email cambridgestpapers@yahoo.com to secure your spot today! *The fine print: buy 75 get 25 promotion applies to wedding orders and can include invitations, reply cards, save the dates, menus, programs, or any other wedding-related stationery item. 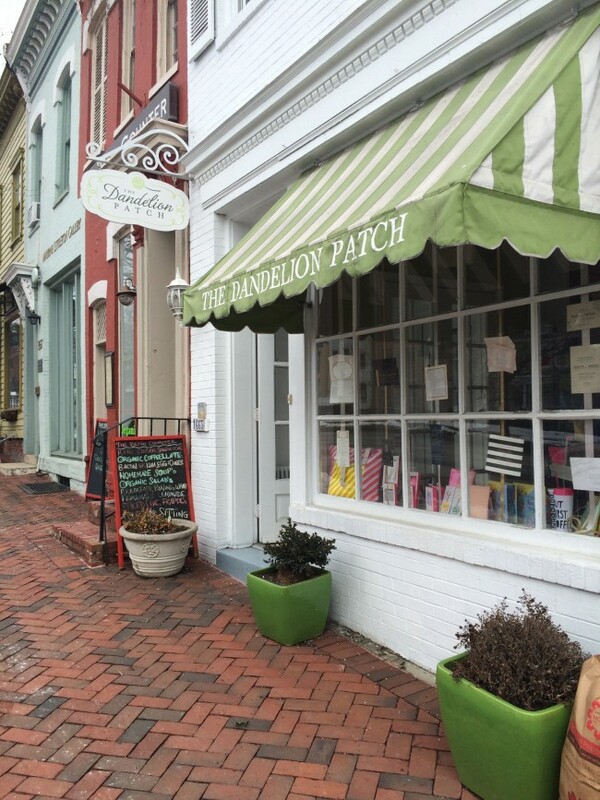 Recently we sent Kyle, our lead client coordinator, and Mariel, our lead graphic designer, down to Virginia for a trunk show with our friends at The Dandelion Patch in Vienna, Virginia. 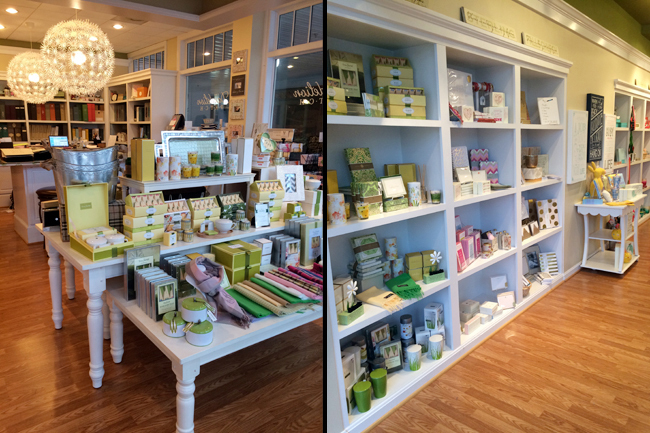 Here’s a look at their beautiful shop before guests started arriving for the event! While they were in town for the event, Kyle and Mariel stopped in to see some of our other Smock dealers — including The Dandelion Patch in Georgetown! 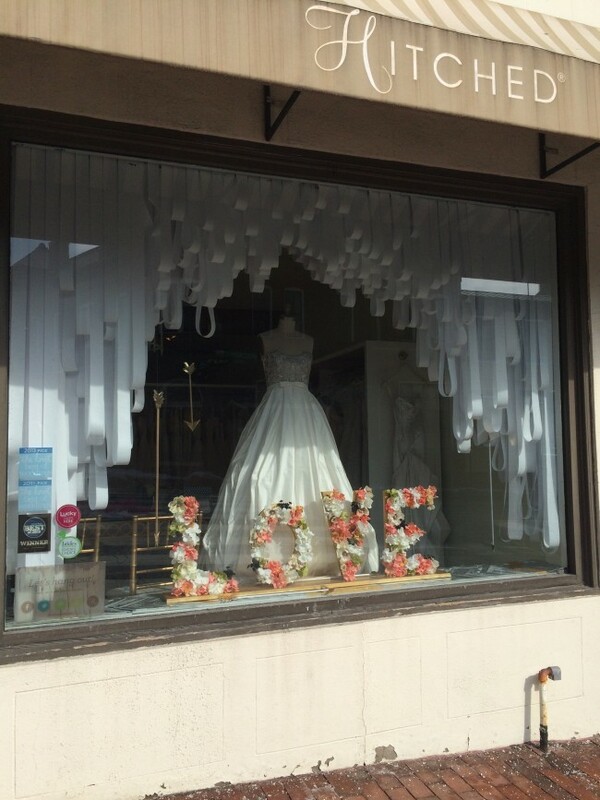 We spotted a few cute Smock customizations in their window display. During their stop in Georgetown, Kyle and Mariel also paid a visit to our friends at Hitched. Specializing in both gowns and stationery, Hitched had some darling displays featuring their favorite Smock and Bella Figura invitations. And how cute is that window installation!? 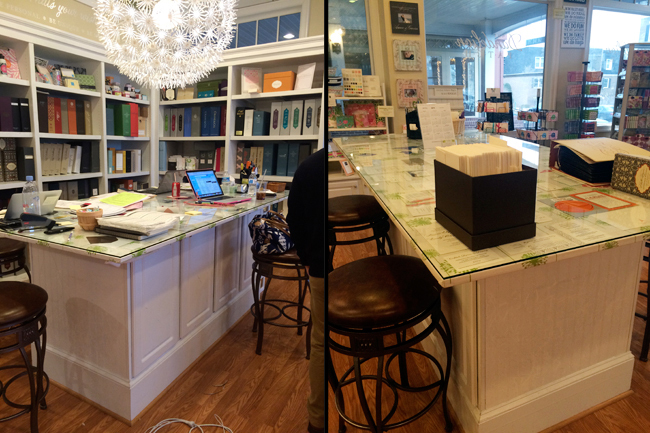 Our team also popped into Just Paper & Tea, another stationery shop in the Georgetown neighborhood. During their trip, Kyle and Mariel made time to see Toni at The Write Image, too. Toni’s home studio boasts many albums, including every Smock album and several from Bella Figura! 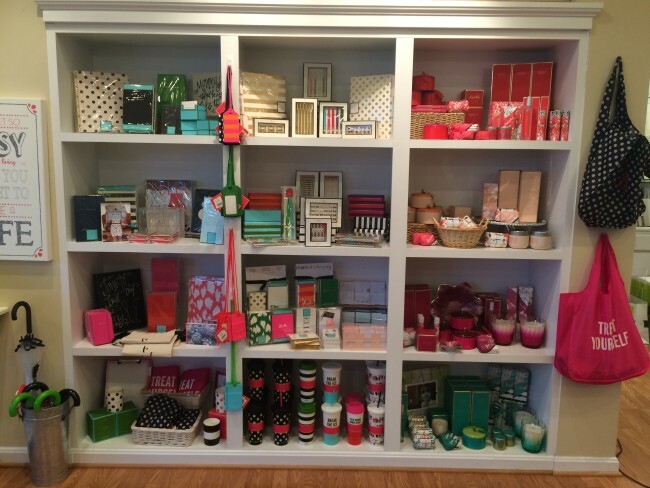 Our team also got a peek inside the Preppy Pink Pony’s brand new location in Mclean! They’re still getting settled in, but here’s a look at their colorful new counter display. Many thanks to our Smock dealers who made time to see our team! 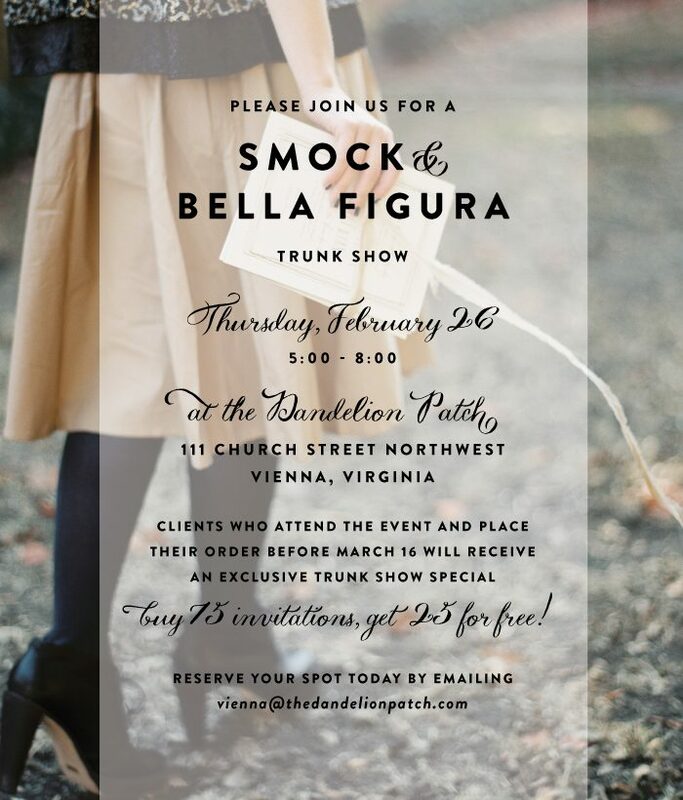 Join us this week with our BFF Bella Figura for a trunk show event at The Dandelion Patch! 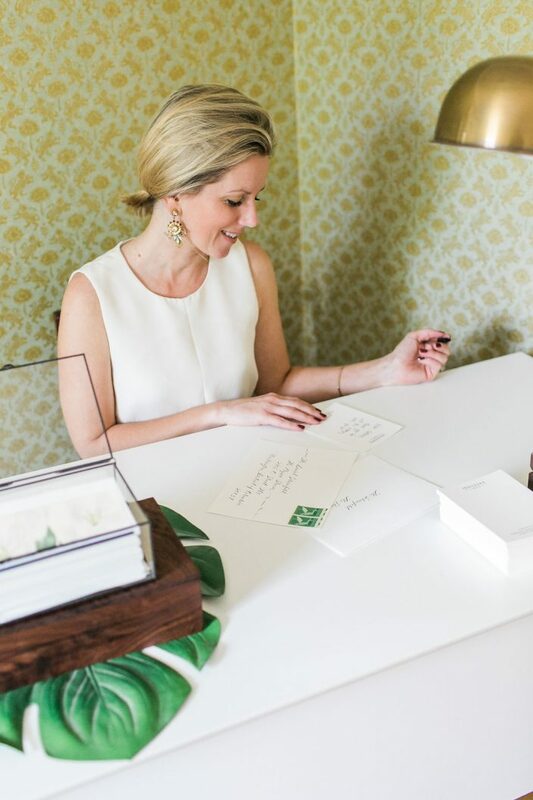 Clients who attend the trunk show and order before March 16, 2015, will receive 25 free invitations* with the purchase of 75 invitations or more. Reserve your spot today – we can’t wait to see you there! 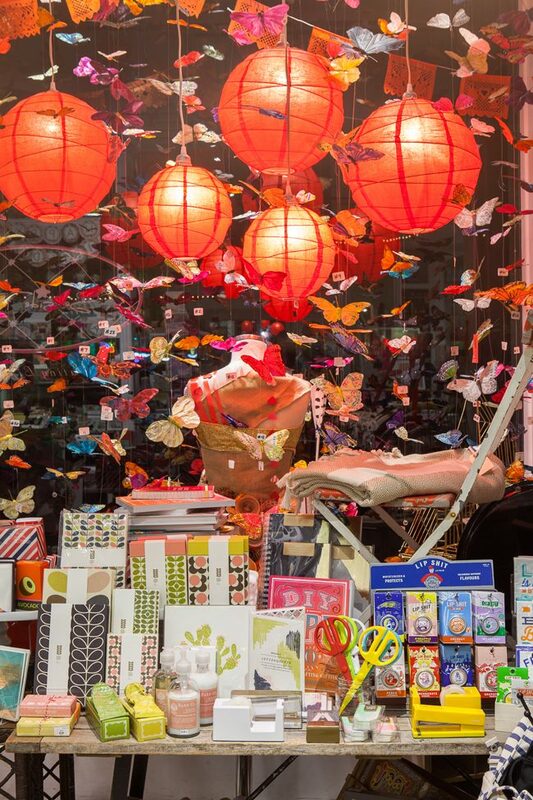 We saw a peek of the gorgeous window display that’s up right now at Seaside Papery over on Instagram and just had to see more! 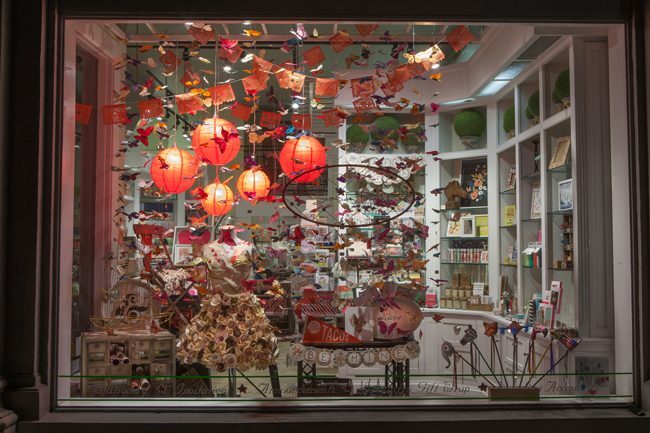 Check out the amazing display that Jori and her team created — fluttering butterflies, glowing paper lanterns, papel picado and our favorite: an inspired dress made out of paper roses! 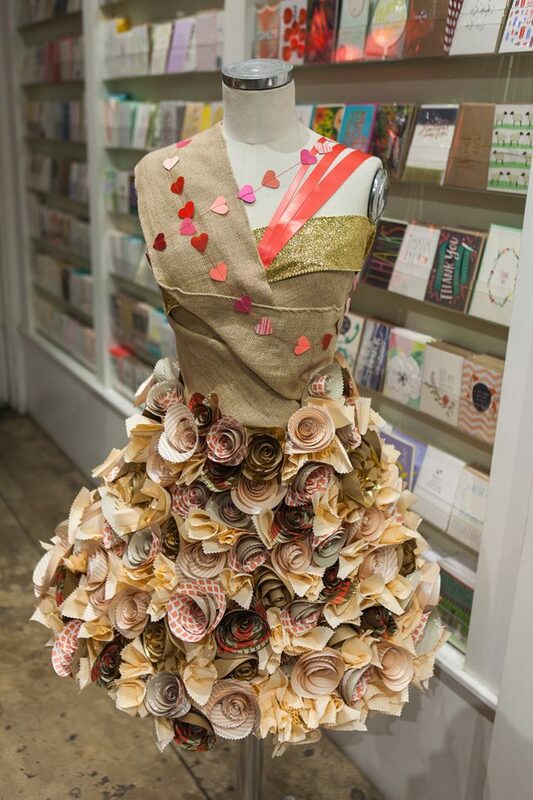 The dress features a variety of papers in shades of pink, red, and papaya, including our Jute double-sided gift wrap. Photographs courtesy of Seaside Papery. 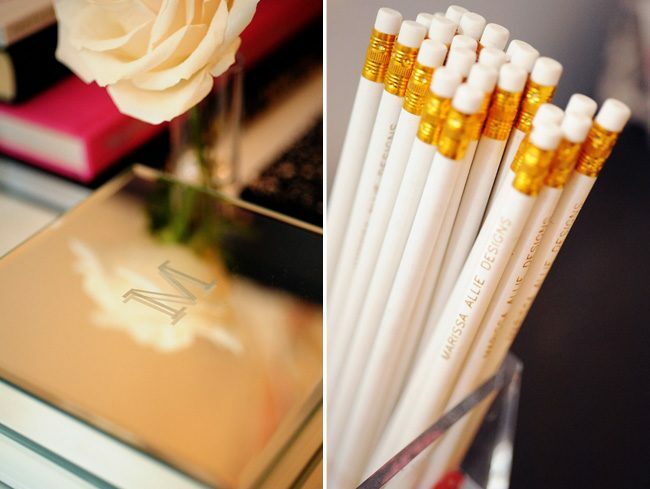 Today we’re sharing a peek inside Marissa Allie Designs, a custom stationery studio based in New York City. Her sweet space is bright and cheery, with pops of pink and lots of artwork. Take a look inside! How she got started: When I began college, I started out studying graphic design at the School of Visual Arts. I learned the importance of typography, and grew to love the many ways a font can express the written word. Throughout my schooling, I explored various outlets such as visual presentation, fine arts & fashion merchandising. All of those years of experience led to what I believe is my passion. I finally figured out that I could do something that let me continuously explore my creativity while guiding people to discover their wedding paper dreams…it was a no brainer! Friends and family began to ask me to help them with all sorts of paper items and eventually Marissa Allie Designs was up and running! 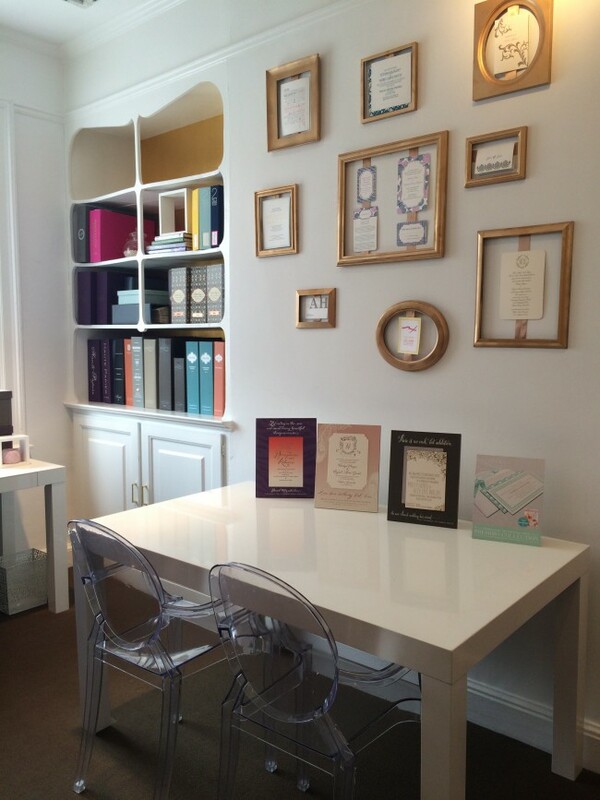 Highlights and challenges: I love the look on clients face when they get to see the final invitation suite. It’s an accomplishment that we worked together to achieve, but it also means that their wedding day is becoming more and more of a reality! The most challenging part is fitting within a clients budget while ensuring them that it is all worth it. Even though budgets can be a tricky task sometimes, I love taking on the challenge to make it work for the client without disappointments. I take pride in spending the time to make adjustments to an invitation suite without compromising the overall aesthetic the client is going for. This way we are all happy and always pleasantly surprised! A Jade bracelet that my husband bought for me on our honeymoon when we made a stop in Hong Kong. I wear it everyday, and it symbolizes protection. An oversized gold flower ring which was my Nana, Emma’s. When she passed, each grandchild was given something of hers, and I always admired this ring. Another ring! This one from my other grandma Nanny, Lillian. A pinky ring which is gold with rubies. Since my hand is much smaller, it fits on my ring finger just right, it is a gem! My dogs memory box that I created, to store all of his things from when we first picked him up from the airport. He is a 2 year old Goldendoodle named Hudson Hoosier, and he is my furry little baby. Old photographs of my family from when my sister, brother and I were kids. We were so happy and our parents gave us so much love and support. Every now and then I glance at them and smile, because it reminds me how lucky I am to have an older sister who taught me the ropes and a younger brother to take care of! Essential stops in your neighborhood: My shop is located in the heart of NYC, and as I tell my family & friends…I thrive off of this city. There are endless amounts of places to explore. I love taking walks over to Madison Square Park and making a pit stop at Eataly, before I head over to the Union Square Green Market. In between, I hit up the local art & paper supply store Paper Presentation, as well as many of my fave stores on 5th Avenue! From the time I leave my studio and get to Union Square I have had my share of sight seeing and entertainment for the day! Many thanks to Marissa for giving us a peek inside her studio! 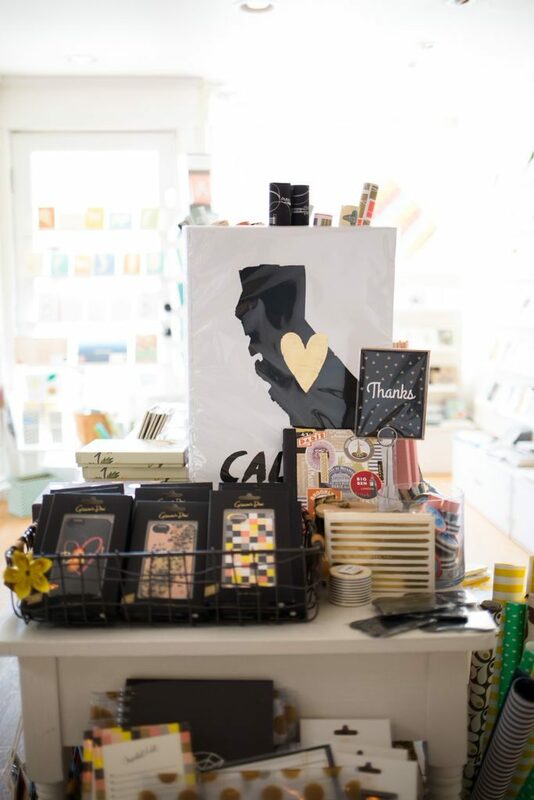 Smock Store Spotlight on Annie P. Paperie! 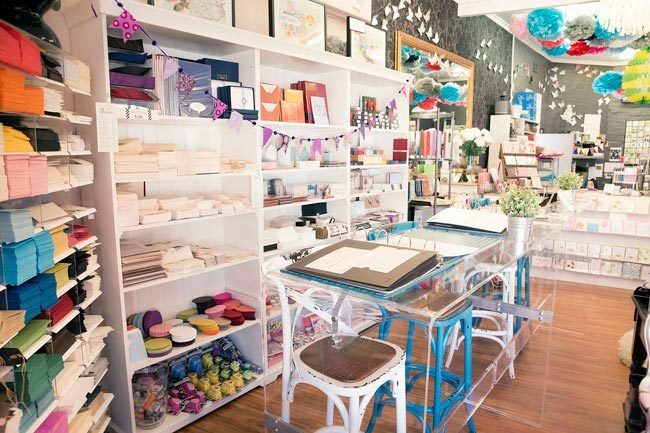 We recently had the pleasure of hosting Jessica Garwood, the art director and store manager of Annie P. Paperie in Perth, Australia. 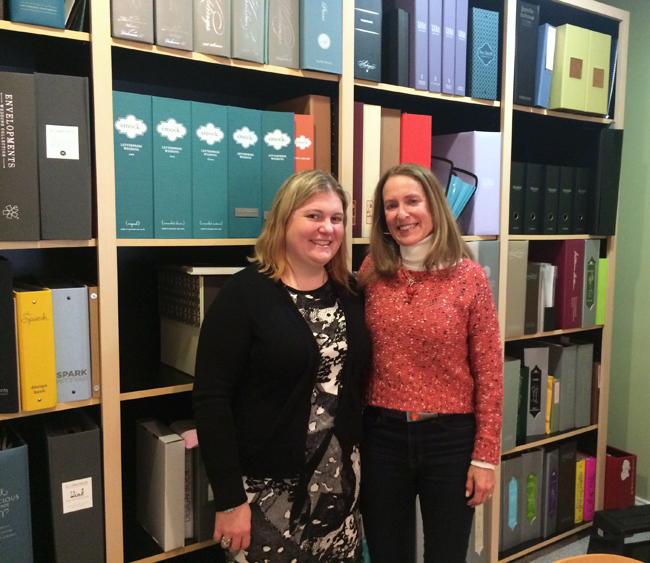 Jessica was in New York for the National Stationery Show and flew up to Syracuse for an afternoon to tour our studio. 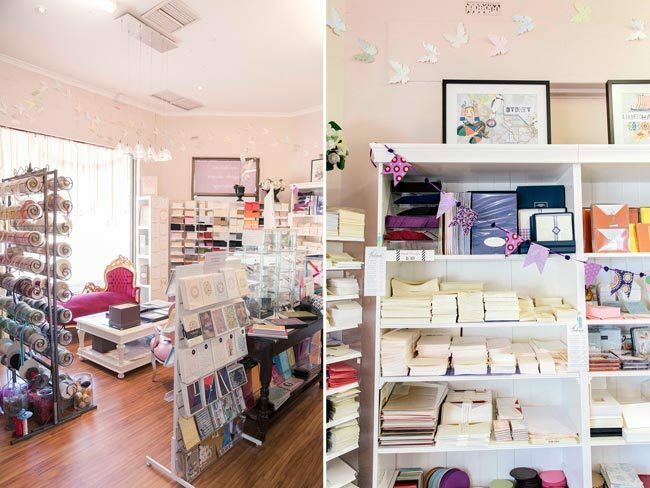 Today we’re sharing a tour of the Annie P. Paperie boutique and a little Q&A with Jessica – take a look! 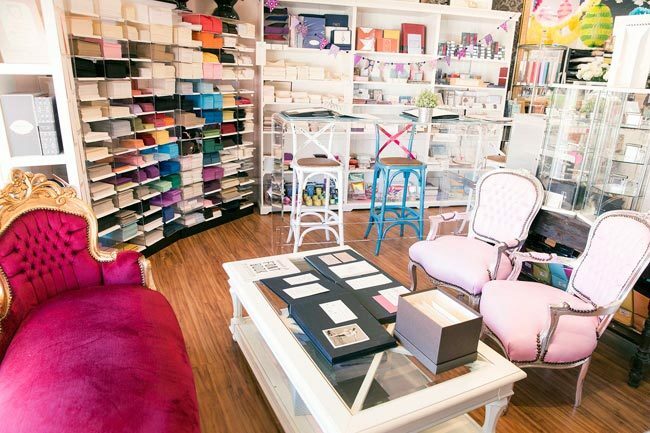 Annie P. Paperie began its life 30 years ago as an art supply store. 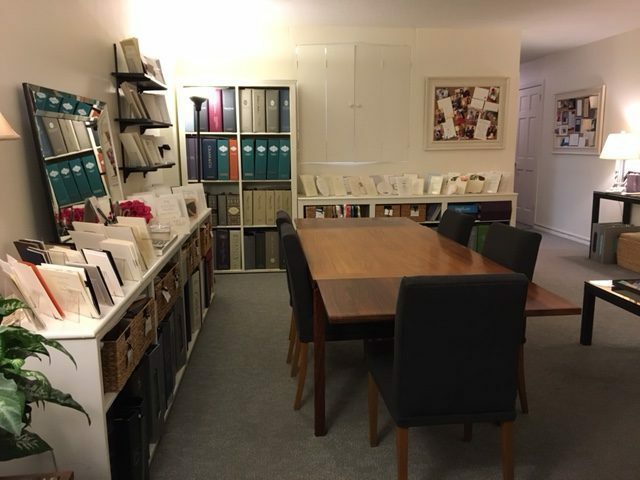 Then in 2002 the owner, Bob Poolman, decided to change everything and create a design stationery boutique, including designing our own range of papers. Today our main passion is working with our clients to design and print their ideal invitations and being able to offer Smock and Bella Figura’s wonderful range of letterpress and foil invitations gives us great joy! We love to source unique products from around the world so that our customers in Perth have access to the best of the best. What do you love most about your job? What’s the most challenging part? I love coming to work in a creative environment every day, being surrounded by beautiful things and all of the great friends I’ve made since I started working at Annie P. Paperie. Most challenging is probably the drive to and from work – especially with the amount of road works we have in Perth at the moment! Does your shop support any special causes? Yes, we love to support local causes when we can! This includes donations of products and children’s birthday party workshops for fundraising events and providing boxes of our paper offcuts to nearby schools. Every year we also support the annual Variety WA Kids Christmas Party, which brings joy to sick, disadvantaged and special needs children at Christmas time. Name your top 5 prized possessions: 1. My cocker spaniel, Jack 2. Having Begun I Had To Go On – a screen print by Australian artist, James Jirat Patradoon 3. A collection of ceramic sugar skulls from Mexico 4. Photos of my family and friends. For the past 2 years I have been taking a photo a day and uploading it on Instagram. It’s great to reflect back on those memories. 5. My oblique pen holder and nibs. I started learning calligraphy last year and it has opened up a whole new world for me. If someone is visiting your shop, what are the other essential stops in your neighborhood? 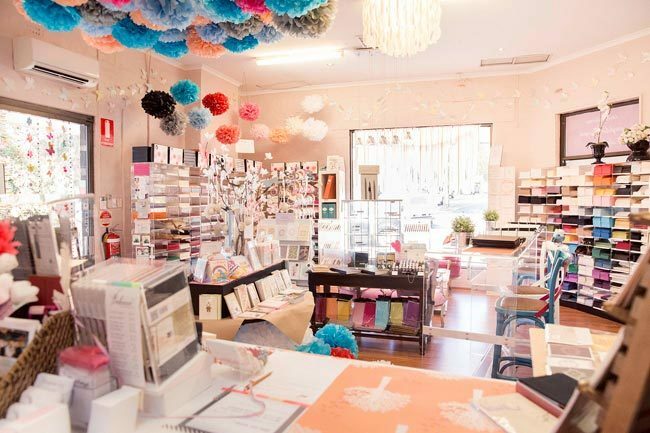 Hire Society – just over the road – is a mecca for everything you would want to hire for an event or party. Typika – our favourite local café to visit for breakfast or lunch. It serves up delicious food and has a great atmosphere. 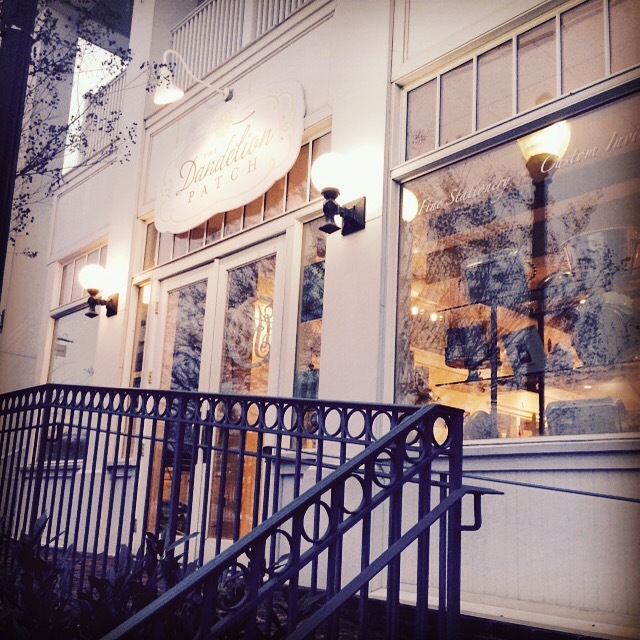 Martineau’s Patisserie – our go to when we need a sweet treat. They have the best French pastries. Corner Store – a great selection of fun vintage homewares and gifts. Touched by Angels – amazing wedding stylists. 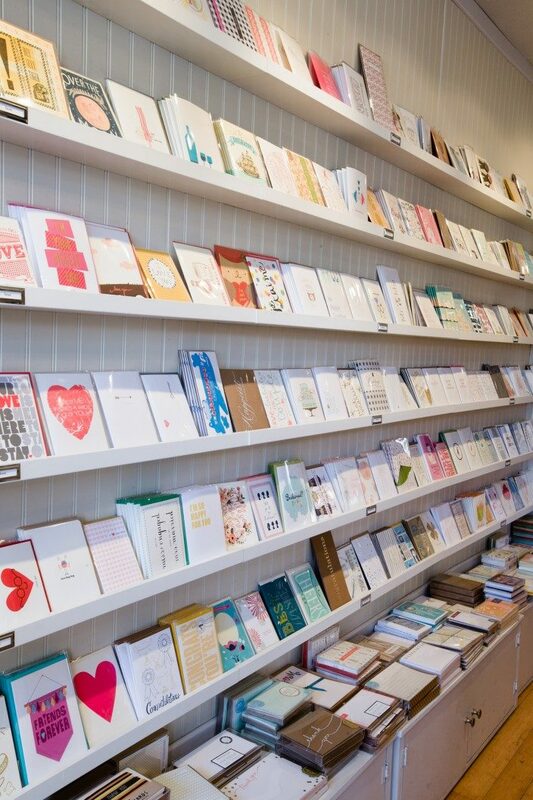 Many thanks to Jessica for giving us a peek inside Annie P. Paperie!